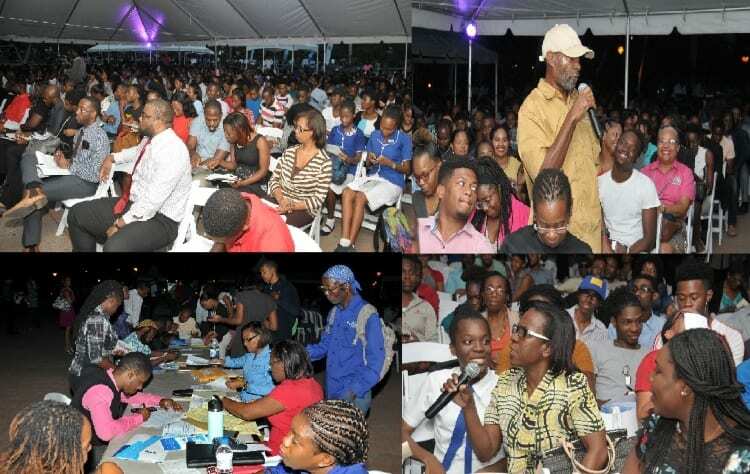 The Jamaica Stock Exchange’s 50th Anniversary Investor Forum held on April 4, 2019, saw over 1,300 persons gathering at the Emancipation Park to understand how to create wealth by investing in the stock market. This event, initially organized to host 400 patrons, had to be relocated from an indoor facility to the Emancipation Park to satisfy the public’s response to the JSE’s open invitation via the social media and on its website. The audience was kept engaged throughout the presentation, while the brokerage firm, Barita Investments Limited, opened accounts on the spot for first time investors. “It was the highest turnout that we have had in the history of the Stock Exchange. It is a historic achievement during our 50th Anniversary. It goes to show how Jamaicans are warming to the idea of investing in the stock market,” said Managing Director, Mrs. Marlene Street Forrest. “Being the number one performing stock exchange in the world says a lot and this has awakened Jamaicans at home and abroad to the possibilities that exist, when they invest in the markets, which has returned over 300% over the last five years. This is significant and of course, persons are looking forward to benefit,” she expanded. “It was an excellent and well-organized event staged by the JSE to educate the public about the benefits of the stock exchange,” Mrs. Vanessa Williams, Manager of Barita Investments Limited, Mandeville branch, and sponsoring broker. “The people are hungry to become participants in the stock market. Barita is committed to helping the public make their money work for them from all income groups and will continue to support the JSE’s thrust for Jamaicans to practice healthy wealth management.” She was supported by Mr. Ferris Jackson, Investment Advisor at Barita’s Kingston Office, who gave the crowd ten (10) top stock picks for investments. “It was about financial inclusion and helping the general public become more aware of the benefits of the Stock Exchange,” explained Mr. Neville Ellis, JSE’s Marketing Manager. Mr. Ellis, who was the first presenter, posited that Emancipation Park was the appropriate venue for them to learn how to emancipate their finances. He informed the audience about the role of the JSE and how it plays a part in the financial landscape of wealth creation and economic development. Mr. Neilson Rose, Financial Advisor and Investor Relations Manager at First Heritage Co-Operative Credit Union, spoke on building a financial portfolio and why persons should ‘not put all their eggs in one basket’ but to have a portfolio of stocks from different sectors to spread their risk. He also encouraged the audience to seek financial advice from persons who are licenced to do so. The audience was informed on how to open a JSE Online Trading Platform account by the JSE’s IT Manager, Miss Suzette McNaught. She shared with the audience the benefits of an online trading account. The winner of the JSE’s 2018 Public Stock Market Game stole the show when he collected his top prize of J$100,000.00. Mr. Rohan Deans of Hanover saw his stock portfolio rise by 2,500%, from J$100,000.00 virtual money to a whopping J$2.53 million over the 10-month period of the Game. He spoke about the lessons learnt from the virtual stock market game and encouraged prospective investors to participate in the Game for a better understanding of the market.